Highest number of crashes in the SR 432 Corridor. Congestion along Industrial Way occurs today and will worsen in the future as traffic volumes increase. Click to view a larger version. 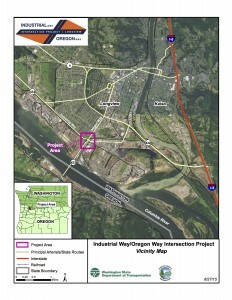 Preliminary design and environmental documentation in compliance with the National Environmental Policy Act (NEPA) and Washington State Environmental Policy Act (SEPA) are being prepared for the Industrial Way / Oregon Way Intersection Project to address traffic congestion, travel reliability for vehicles, emergency response, freight truck mobility, and safety issues at one of the busiest truck tonnage intersections in our state. 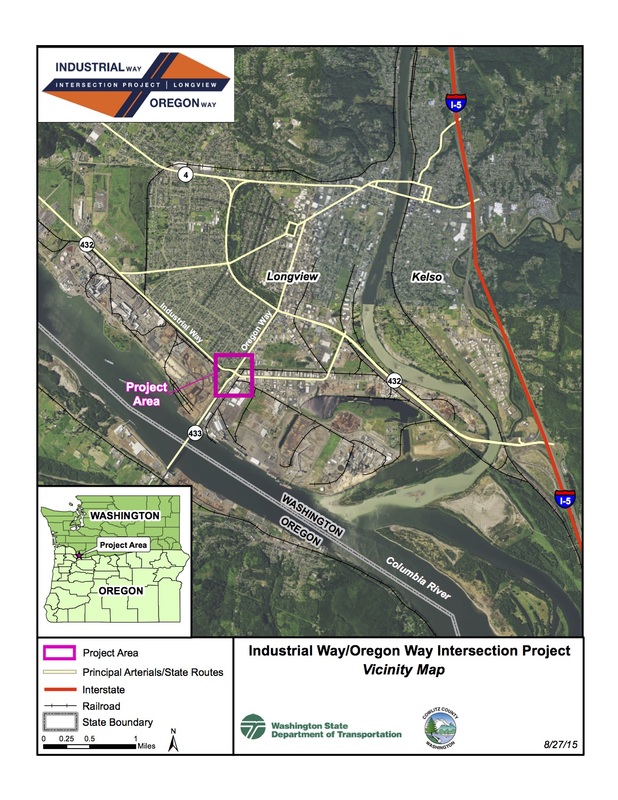 Completing this project is an important component of the long-term economic vitality of Cowlitz County by maintaining critical access to commercial and industrial areas in the State Route (SR) 432 corridor. Reducing congestion improves the economic competitiveness of existing large and small businesses, through reliable and timely freight service, and facilitates economic development by keeping freight truck, employees, residents, and tourists moving through the SR 432 corridor. The existing highway deficiencies were recognized as early as 1968 when the Washington State Department of Transportation completed a Reconnaissance Report in 1968 and followed by a preliminary design of the Oregon Way Interchange at SR 432 in 1971. By 1988, the Lower Columbia ports requested that the U.S. Army Corps of Engineers study the deepening of the Columbia River shipping channel to help the region become competitive in the global marketplace. 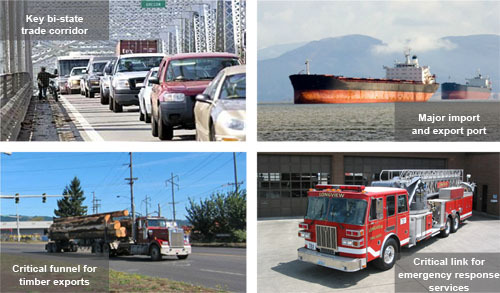 The river deepening increased interest in moving freight through the region, leading to further study of the transportation system that connects to the Columbia River and the Port of Longview in order to handle increasing volumes of freight. The preliminary range of alternatives identified included the No Build alternative and nine preliminary design alternatives that were developed by the project team and incorporated comments gathered through stakeholder input, the public scoping process, and public open houses held in September 2015, March 2016, and September 2016. The project team conducted a two-step screening process to narrow the range to those alternatives to be studied in the Draft EIS. The first step of the screening process focused on the operational performance. The preliminary results of this screening were shared with the public at the open house in September 2016. Four build alternatives passed the Operational Performance Screening (in addition to the No Build that is advanced in accordance with NEPA) and were advanced to the second screening process. Following the results of the Operational Performance Screening, the four alternatives that were advanced for further evaluation were refined to include optimizing the main structure location, providing for local access connections, and providing more detailed design feasibility. The second step of the screening process (Context and Cost Screening) focused on safety, impacts to businesses and residences, local travel circulation, environmental impacts, and cost. The results of this screening were shared with the public at the open house in January 26, 2017. The second step of the screening process resulted in two of the remaining four preliminary design alternatives (Grade-Separated Option A Alternative and Partial Grade-Separated Option B Alternative) advancing from the second screening to be recommended for further study in the Draft EIS. The No Build Alternative was evaluated and advanced, as required, for further analysis in the Draft EIS. The three alternatives are described in detail in the Draft EIS published on March 2, 2018. The results of the environmental impact analysis documented in the Draft EIS was discussed with the public at the open house / public hearing on March 20, 2018. 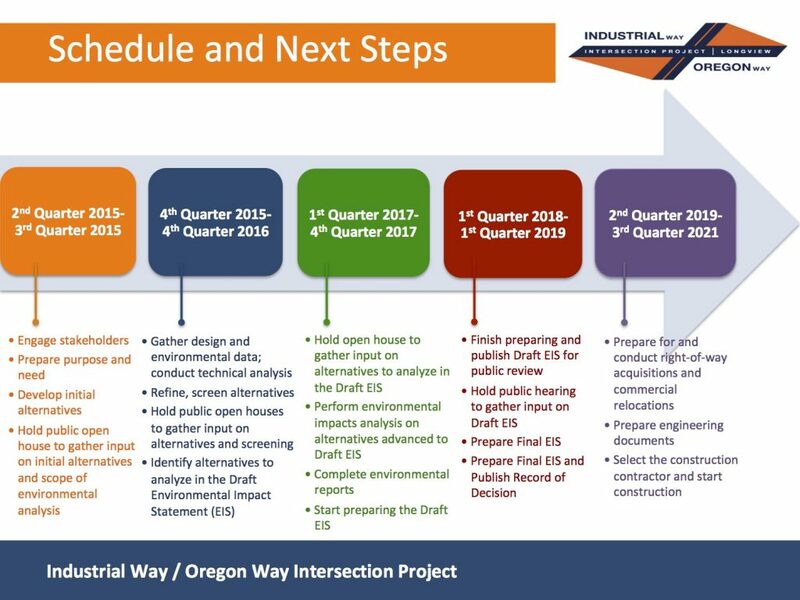 The Project’s Executive Committee reviewed the environmental analysis of the two “build” alternatives and the “no build” alternative presented in the Draft EIS and the public comments received at the March 20th public hearing and during the Draft EIS public comment period. Following this review, the Executive Committee identified the Partial Grade-Separated Option B (PGSB) as the Preferred Alternative. This recommendation will be documented in the Final EIS. The County is leading the partnership while working closely with WSDOT, the Federal Highway Administration, other regulatory agencies, and the public.